It was very hard to find fault with anything that Facebook announced at F8 last week. Unlike their past developer efforts, which were all about pulling content onto Facebook, this year was about pushing Facebook’s infrastructure out into all kinds of mobile apps. The win for Facebook is that much more signal about their users, particularly about their app usage; the win for developers is being a part of the new Facebook Audience Network. The latter is a very big deal. One of the key lessons I learned working with developers is that, at the end of the day, everything pales in comparison to the question: “How do I make money?” Developer tools are important, languages are important, exposure is important, but if there isn’t money to be made – or if more money can be made elsewhere – then you’re not going to get very far in getting developers on your platform. Both Google and Twitter are looking to edge in on Facebook’s territory; Twitter launched app install ads of their own last week, and Google is doing the same for search and YouTube, with the killer advantage of knowing exactly which apps Android users are already using. So to recount, Facebook is going gangbusters because of ads for free-to-play games, developers are excited about the chance to cash in via Facebook ads, Google and Twitter are trying to mimic Facebook’s success, and Google and especially Apple are hanging their app store hats on the amount of revenue generated by in-app purchases. 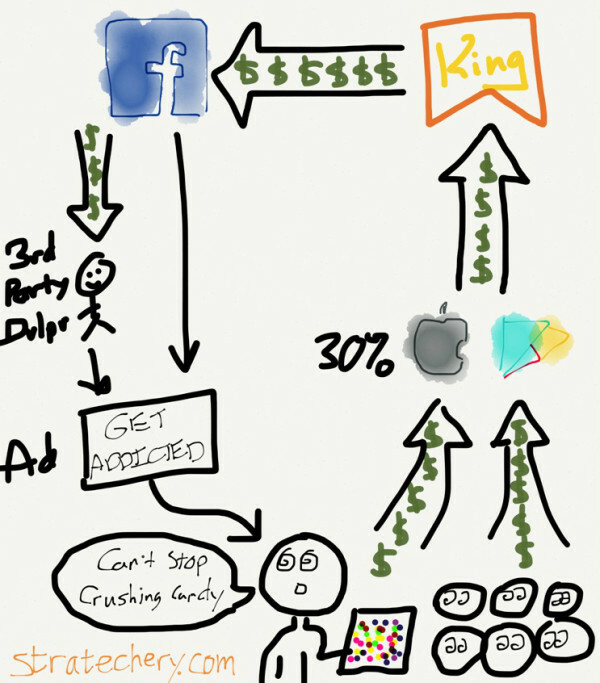 App stores take 30% of in-app purchases; the remainder goes to free-to-play publishers like King. These publishers, in turn, drive the majority of Facebook mobile advertising, as that is the best channel to find more digital whales. And now, 3rd-party developers can get their piece. In other words, billions of dollars in cold hard cash, and 20x that in valuations are ultimately dependent on a relatively small number of people who just can’t stop playing Candy Crush Saga.